As Olivier Wevers’ company, Whim W’Him, wraps up its eighth season, once again I’m struck by the versatility of his seven dancers. From the longest tenured, Jim Kent, to newbies Cameron Birts and Adrian Hoffman, Whim W'Him dancers can deliver an array of technical goods. And that’s exactly what they were called upon to do for the season's final program, a triple bill called Transfigurate. The offerings ranged from Danielle Agami’s whimsical (how fitting) Duck Sitting, a commentary on our contemporary digitally-obsessed culture, to Pascal Touzeau’s rigorous Stickers, to Wevers’ Silent Scream, part amusing take off on the silent film era, part social critique, and altogether a farewell showcase for long-time company member Tory Peil, who leaves the company after this season. Touzeau’s dance opens the program. Set to a challenging violin composition by Sofia Gubaidulina, Stickers is the kind of work that tests both the dancers’ technical ability and their concentration. At a rehearsal earlier this month, I watched Touzeau push the cast to perfect their timing, to match their movements exactly to the irregular rhythms of the score. As he explained to me, if the timing isn't exact, the intent of the dance is obscured. I was eager to see how it would go in performance. Onstage, with Michael Mazzola’s moody lighting design and sheer costumes by Nova Dobrev, Stickers transforms from studio discipline into a series of seemingly random encounters. But instead of humans interacting, the dancers were more like neurons firing in our brains. Touzeau’s movement vocabulary is spiky; feet point into the air, with toes flexing upward. Hands extend behind the back, fingers unfurled like nerve ends. While much of the dance centers on Karl Watson and Jim Kent, who perform not so much a series of duets as a series of mechanical interactions, for me the highlight was watching fluid Liane Aung dance with Adrian Hoffman. Aung is one of those dancers who can deliver an array of movement with her silky limbs. Hoffman, new to the company this season, is equally supple in this pas. After a break, Agami’s Duck Sitting begins to throbbing percussion. The seven dancers look like Madison Avenue castaways, dressed in shreds of business suits. It feels a bit like the artistic collision of Gilligan's Island and Lord of the Flies. These castaways are angry, alienated, and they dance out their emotions. Cameron Birts jumps forward, then continues to jump through the other six dancers, each of whom is moving to her own interior choreography. They clump into a pile center stage, and Hoffman, hair disheveled, looks out at the audience and waves in acknowledgement, prompting his fellow dancers to join in. The dance takes a light turn at this point, the dancers miming texting, distancing themselves from one another through the simulated light of their small smart phone screens. It was fun to watch but it felt as if the momentum at the start of Agami's creation sort of fizzled away. The evening ends with Wevers’ Silent Scream, inspired by Charlie Chaplin’s The Great Dictator, as well as by pantomime. 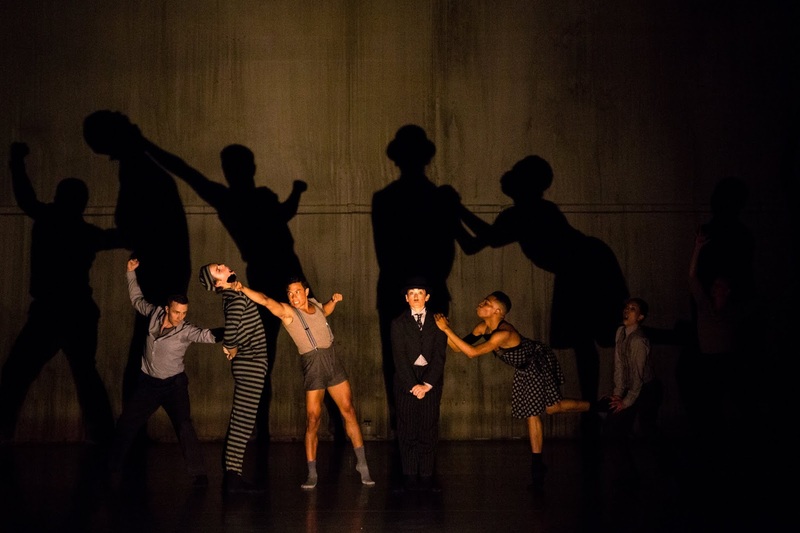 Each of the dancers is dressed as an archetypal figure: jail bird, femme fatale, working stiff, and Chaplin himself. Peil is the heart of this dance, eventually stripped from trousers and a work shirt to her white skivvies. As Chaplin's voice urges us to forge a kinder, more just society (a resonant message if there ever was one) Peil is the stand-in for everyone who’s being battered by incivility and hatred, by oppression and discrimination. I was struck in particular by her duet with Cameron Birts, who portrays the femme fatale, clad in a vintage polka dot dress. Peil is a tall cool blonde; Birts is compact and dark skinned, with incredibly long arms. As partners, Peil performs the traditional “male” role: lifting Birts up, taking the lead as they twirl together. Artistic Director Wevers has taken great care over Whim W'Him's eight years to recruit technically excellent dancers. It's a small company; there are no official stars, but during her tenure he's called on Peil to portray everything from humor to emotional disintegration, to twist her long body into knots and to soar across the stage. I’ll miss Peil; along with Jim Kent, she's helped to build the company, to present the array of choreography Whim W'Him has brought to dancer lovers in the region. Artistic departures are never easy, but I'm encouraged when I watch WW newcomers Adrian Hoffman and Cameron Birts. Along with Kent, Aung, Karl Watson and the ever-steady Mia Monteabaro they're the foundation of a company that offers something unique to local dance lovers.